Background: Dehydroepiandrosterone (DHEA) is an important precursor of active steroid hormone, produced abundantly by the adrenal cortex with an age-dependent pattern. Objective: We investigated whether chronic DHEA administration impacts on redox status and on Akt protein activation in skeletal muscle during the aging process (3 and 24 months-old rats). Methods: Rats received one weekly dose/5 weeks of DHEA (10 mg/kg) or vehicle. Gastrocnemius muscle was removed to evaluate glutathione system, hydrogen peroxide, antioxidant enzymes, and expression of Akt kinase protein. Results: In the 3-months-old rats DHEA induced an increase in hydrogen peroxide when compared both to its control (276%) and the 24-months-old DHEA group (485%). 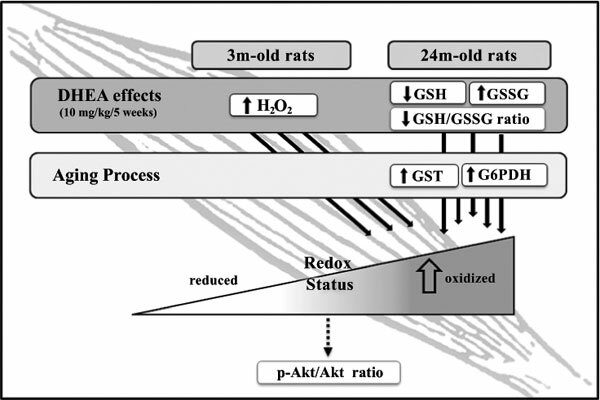 Moreover, in the 24- months-old rats DHEA caused an increase in GSSG (41 and 28%), a decrease in reduced-GSH (55 and 51%), and a more oxidized redox status (reduction in GSH/GSSG ratio, 47 and 65 %) when compared to 3-month-old DHEA and to 24-months-old control groups, respectively. Both older groups had increased G6PDH (2.7 fold) and GST (1.7 fold) activities when compared to younger groups, independently of any DHEA treatment. However, there was no modulation of Akt protein (phosphorylated/total isoform). Conclusion: The results show that chronic DHEA administration to 3 and 24-months-old rats may not present positive effects regarding the redox environment in skeletal muscle without modulation of pro-survival Akt kinase. Due to the large-scale self-administration of DHEA as an “anti-aging” dietary supplement, it is crucial to investigate its molecular mechanisms over oxidative stressinduced related diseases. Keywords: DHEA, aging, skeletal muscle, glutathione, hydrogen peroxide, Akt. Keywords:DHEA, aging, skeletal muscle, glutathione, hydrogen peroxide, Akt. Abstract:Background: Dehydroepiandrosterone (DHEA) is an important precursor of active steroid hormone, produced abundantly by the adrenal cortex with an age-dependent pattern.